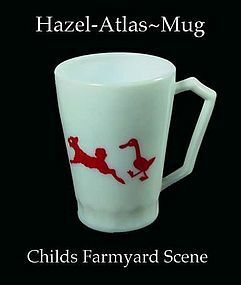 This child's youth mug was made by The hazel Atlas Glass Co in the 1940's. It is the same blank as the Shirley Temple mugs. It has a red barnyard scene on it. 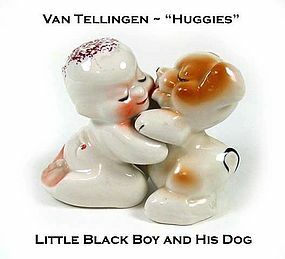 These Van Tellingen Little Black Boy and his dog huggie shakers are in great condition. Bright and shiny glaze, and superior paint trim. Both shaker are marked and appear unused. 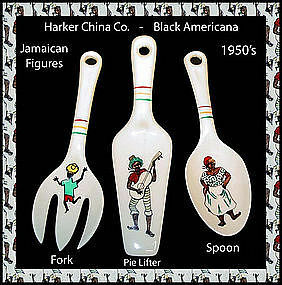 They were made between 1947 and 1951. The boy has his red-buttoned drop seat pajamas and the cute spotted pup with a red tongue and curly tail. Cool! This pair of Pigmy Salt & Pepper Shakers are made in Japan, probably in the 1950’s or so. They are very well decorated and of higher quality. One of the books show this Pigmy Mama with a different shaker, but we are pretty sure these are the correct ones. Nicely decorated and well marked. We would guess the Mama is the SALT, and the Baby Girl is the PEPPER shaker. Well done!!! 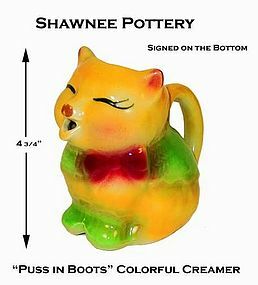 This desirable Shawnee "Puss in Boots" creamer with vivid colors is in excellent condition! The bottom is embossed with the Shawnee ~ USA name. Nice vintage 1950’s item. This General MacArthur charactor mug was made between 1946 and 1948, and is marked: "Made In Occupied Japan". It is well done and has a nice glaze on it. We doubt if it was ever used.